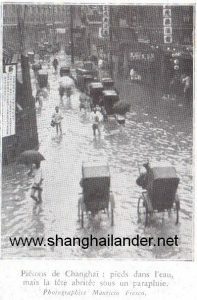 I recently came across this amazing picture of flooded street of Shanghai in 1933. Although considered as subtropical, Shanghai climate really has very different seasons with steep differences in temperature. Winter can be very cold, with snow (see post “Feeling like European winter” and “Snow in Shanghai” for more details). Summer are very hot and humid, giving an equatorial feeling to the city with Cicadas sound (See post “Shanghai heat“, and “Singing trees“). Another feature of Shanghai climate is tropical rain. As the city is not tropical enough to received massive rain all year around, like Hong Kong or Taipei, it always seems to be taken by surprise every time a typhoon hits the city. Pictures in this article is taken from 11th November 1933 issue of French newspaper L’illustration. The caption is “One of the main streets of Shanghai after the typhoon”. French readers will notice that Shanghai is spelled “Changhaï” as it was spelled in French then. I have not been able to identify the street shown, but it looks very much like a large street in the Chinese city, as main Concessions streets in the 1930’s were already lined up with much higher stone building. 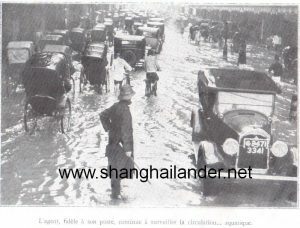 The pictures were actually taken during 20th September 1933 typhoon that flooded the city. It mentions that Chinese city wooden houses are very exposed to the typhoon, but the main body of the article is focused on the Jesuits weather forecast network based in Xu Jia Hui, collecting information from all over Asia to predict the weather. It is nowadays Shanghai weather forecast institute in Xu Jia Hui, still on the same location. Once it was sure that a Typhoon was coming, the information was broadcasted by radio to ships at sea. The article also mention that canons shot were used at the harbor as the usual way of warning ships. Although it is not mentioned in the article, flags were probably raised on the Shanghai Bund Semaphore, also called Gutzlaff tower (see post “Best view on the French Bund” for more details). Flags were a usual way to give instructions and warning to ships at that time. 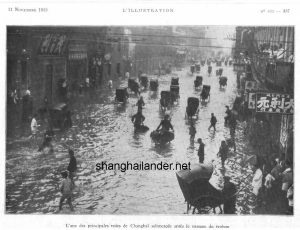 Shanghai sewage network has been upgraded in the last years, so flooding when a typhoon comes to the city do not seem to happen to that extend anymore. 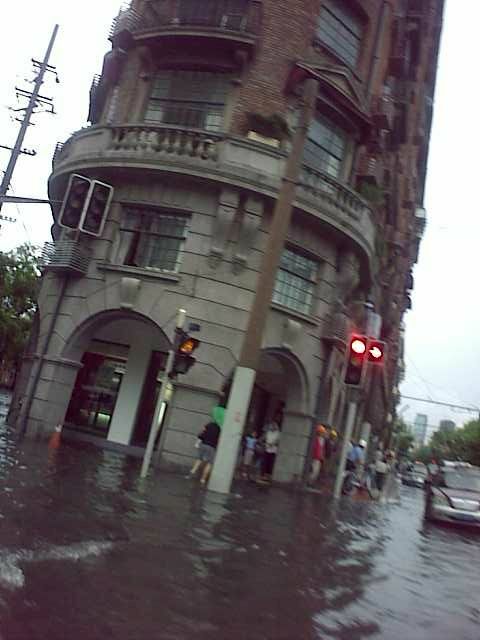 This is quite a recent development, as similar scenes were a regular feature in the former French Concession… as seen in enclosed picture taken in July 2009.